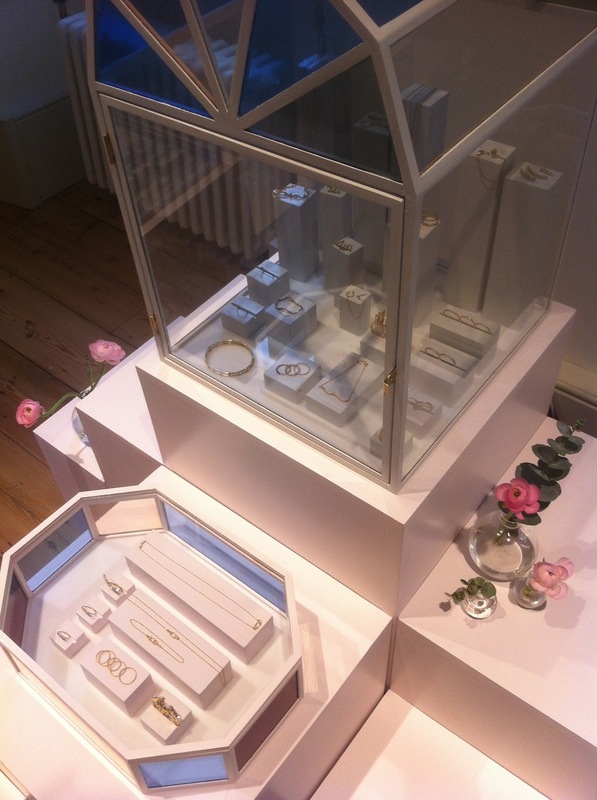 Rock Vault, curated by the darling of British jewellery design Stephen Webster, is a platform for exceptionally talented British jewellery designers to showcase their work at London Fashion Week. Made from rare and precious materials, jewels more than any other fashion medium, must condense the whims and moods of the latest trends into enduring pieces which will remain available for seasons to come. With the industry being thrust further into the limelight with each passing season, pieces are quickly developing in sophistication and beginning to align more closely with the ethos of fine art, as craftspeople and designers collaborate to create work with both emotional depth and physical perfection. I arrived at Rock Vault expecting to enter some kind of darkened atmospheric bunker, instead I was ushered into an airy white washed gallery space at the palatial Somerset House and let loose to handle some of the most exceptional jewellery I have ever laid eyes on. 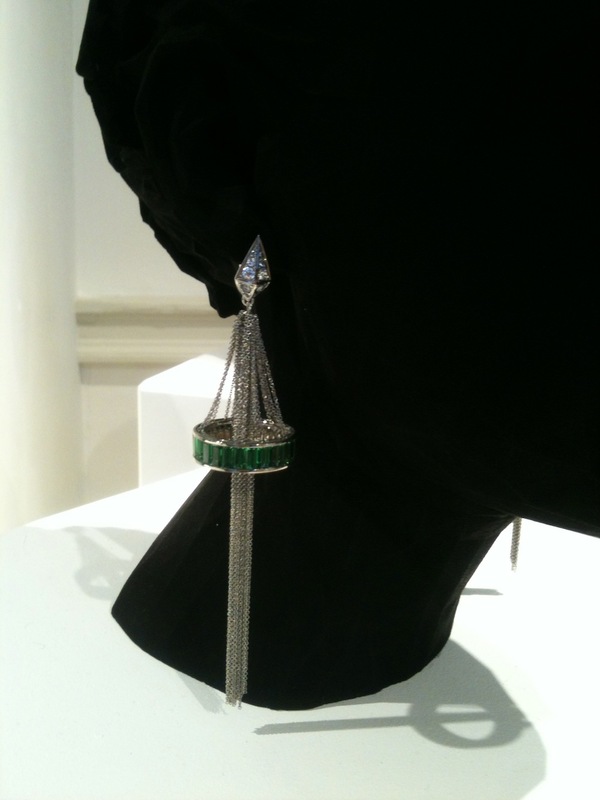 Invited as part of the exhibition to design a pair of red carpet earrings in palladium, the selected designers had outdone themselves in their efforts to impress. Earrings present a particular challenge, as the pieces have to be meticulously balanced to create the perfect drop, and so I was especially impressed with the asymmetrical designs by jewellers Hannah Martin with her hard-hitting architectural earrings, Sophie Bille Brahe‘s delicate constellations and especially the rearing, metamorphosing horses by Yunus & Eliza. 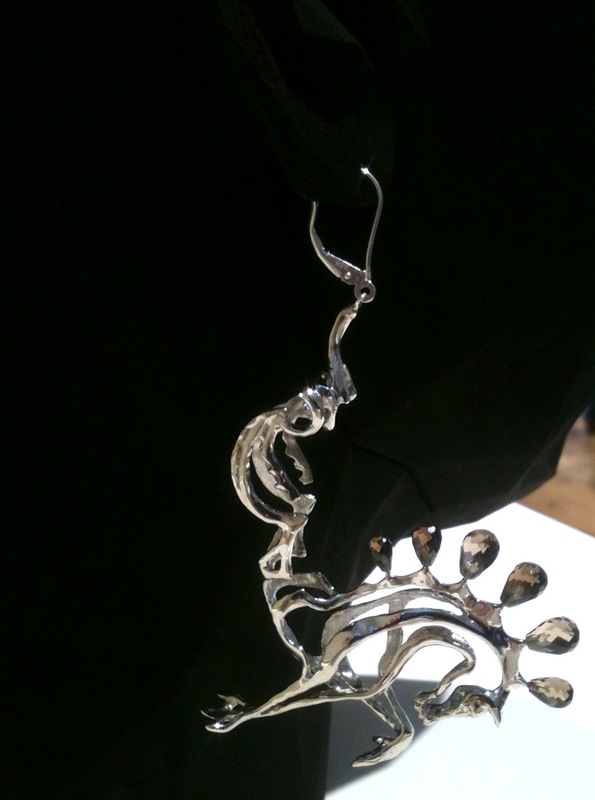 With designers looking towards winter, the jewellery is getting dark and wild again, especially in Hannah Martin’s new collection Delirium. The last of three bodies of work continuing her exploration of the masculine aesthetic inspired by the story of Comte de St Germain, the infamous man who knows everything. 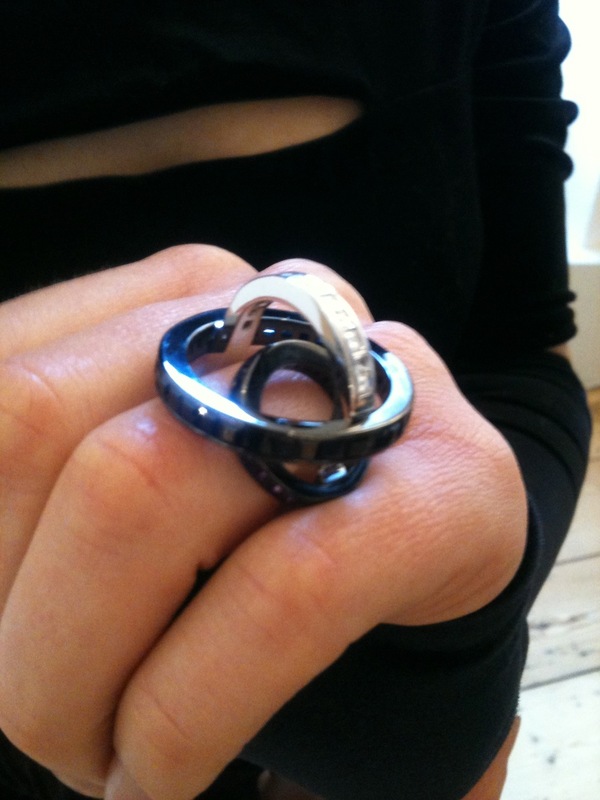 Hannah has created a series of night-time jewels with a dramatic architectural aesthetic that would look comfortable paired with both a leather jacket and motorcycle boots or an evening dress. Building her collections around an always male fictional character, Martin is fascinated with androgyny and how gender can be merged creating a middle ground between the sexes. Working in yellow gold, her preferred metal, Martin balances her masculine designs by dabbling with hallucinogenic colours such as magenta and rich amethyst hues. Tomasz Donocik‘s designs also have an aesthetic that would suit clientele from the young and edgy to the established and elegant. 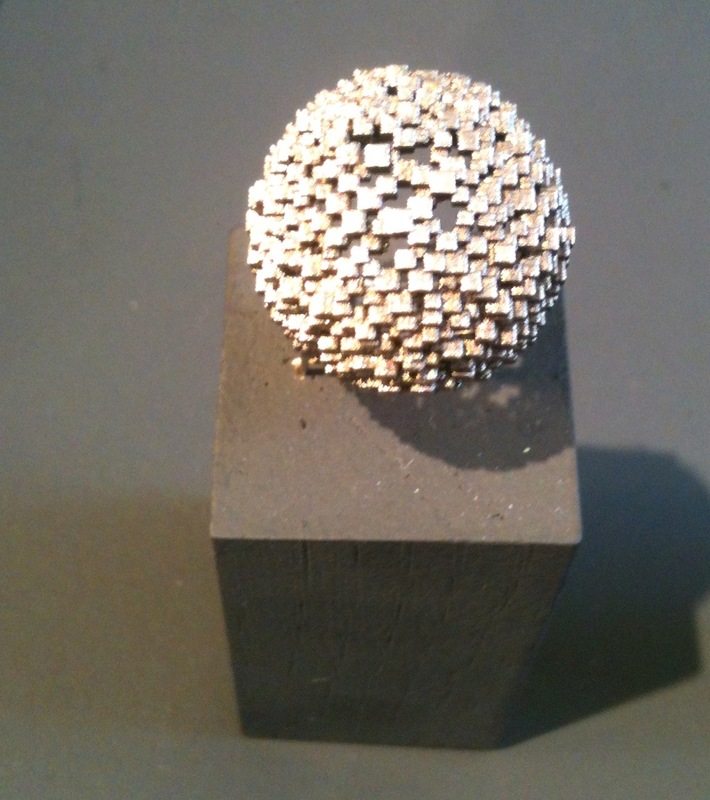 Working with leather and metal, Tomasz is revisiting his trademark star designs and developing them by encrusting them with diamonds and dabbling in new materials, but the he main attractions are his stunning private commissions including a realistic crocodile ring with a moveable mouth and a ruby hiding in its teeth. 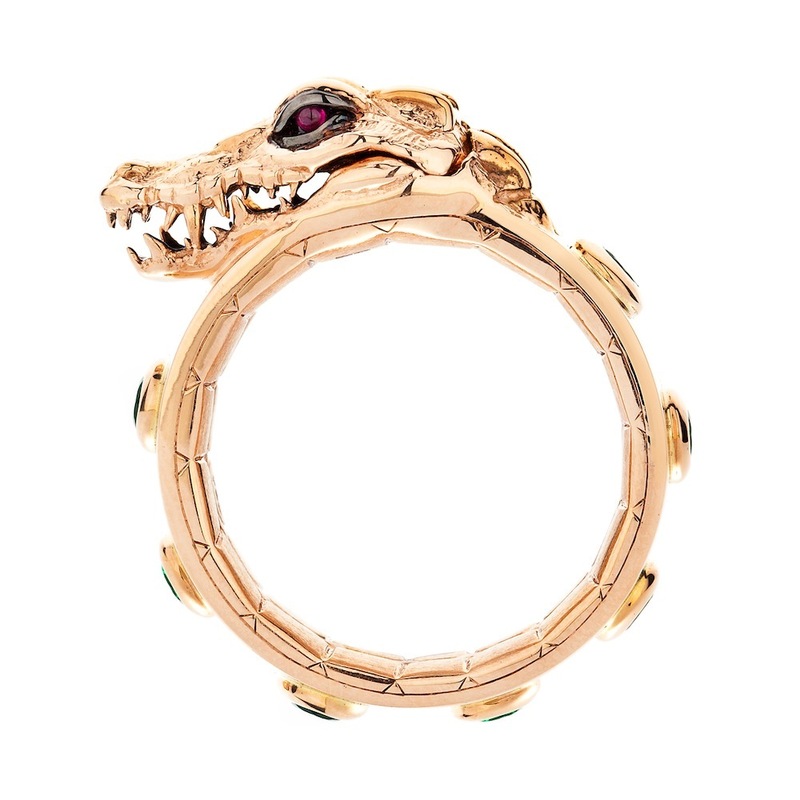 Fear not, animal lovers, the ring has not been cast from a real baby crocodile, the realism is the result of painstakingly carving the crocodile out of jewellers wax and then casting it in precious metal. Out of all his meticulous creations, the Courtship of the Hornbill ring, an exceptionally beautiful piece complete with sculpted mammoth tusks, remains the pride of Donocik’s collection. Natural materials are also a feature in the unabashedly feminine designs of Melanie Georgacopoulos (below), who is redefining the modern pearl with her trademark Sliced Pearl jewellery. For her AW13 collection, Melanie unveiled her collaboration with Japanese fine jewellery company TASAKI, inspired by the inherent contradictions in the symbolism associated with pearls. The pearl, a traditionally feminine stone, is symbolic of power and wealth, and yet its organic composition also has connotations of wholesome natural life. Mixing the texture and colour of natural stones and juxtaposing them with solid unyielding metals, Georgacopoulas contrasts dark and light, fragility and robustness in her intriguing new designs that range from enormous draping statement pieces to delicate jewels that feel neatly self-contained. It has been said in the fashion world that a minimalist aesthetic is the most difficult to pull off and only for the brave of heart but Sophie Bille Brahe and Husam el Odeh are jewellers that accomplish it with flair. Sophie Bille Brahe, adamant that her pieces are not designed to be status symbols, crafts her jewellery on a strikingly diminutive scale in comparison to her contemporaries. Using the simple combination of gold, sterling silver and diamonds in her new collection Le Palais Invisible, Brahe aims to make visual poetry out of the tragic tale of Atlantis, the island that sunk into the ocean in a single night of misfortune. Husam el Odeh, also a talented young designer with a penchant for minimalist and poetic design, was wearing his trademark silver pencil around his neck. 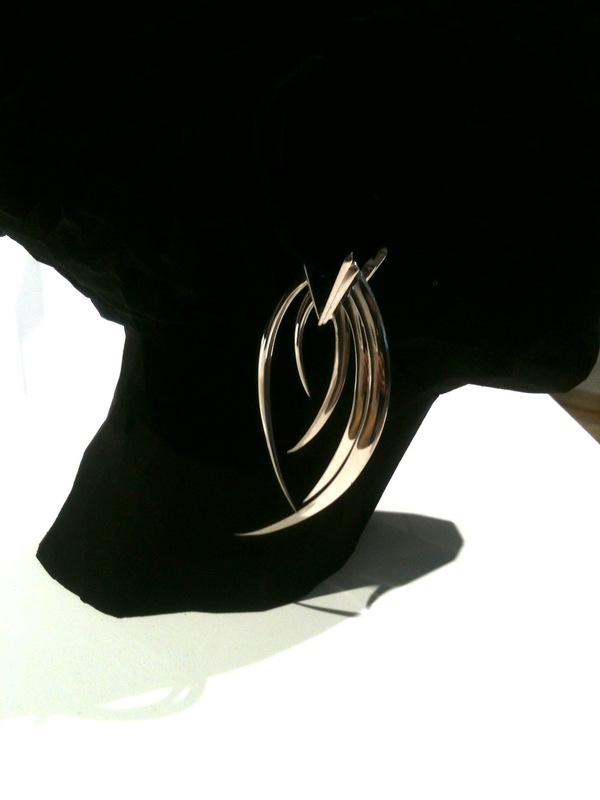 Inspired by everyday objects, turning them into cutting edge jewels, Odeh takes the mundane and makes it beautiful. 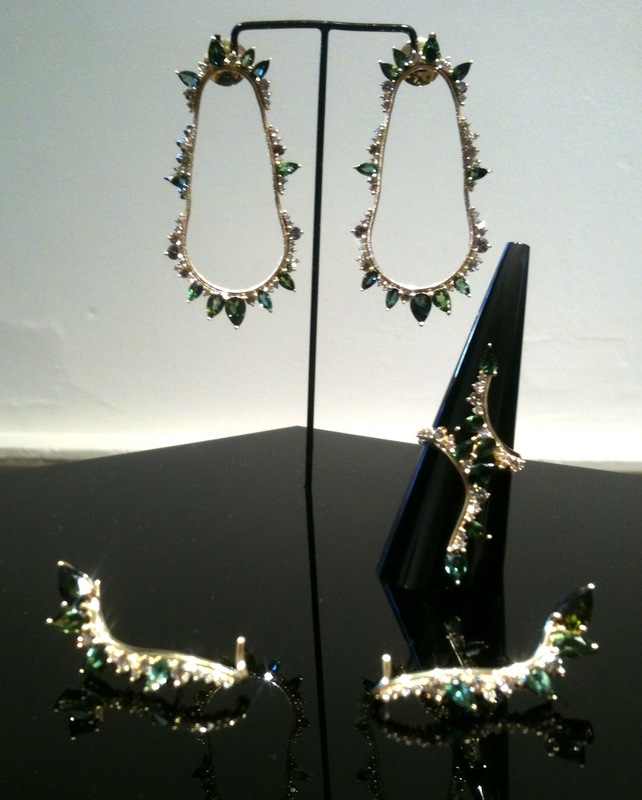 There were some fascinating new pieces in Fernando Jorge‘s new Electric Collection, with an array of bright pear shaped stones creating the sense of static electricity buzzing vibrantly around his jewels. 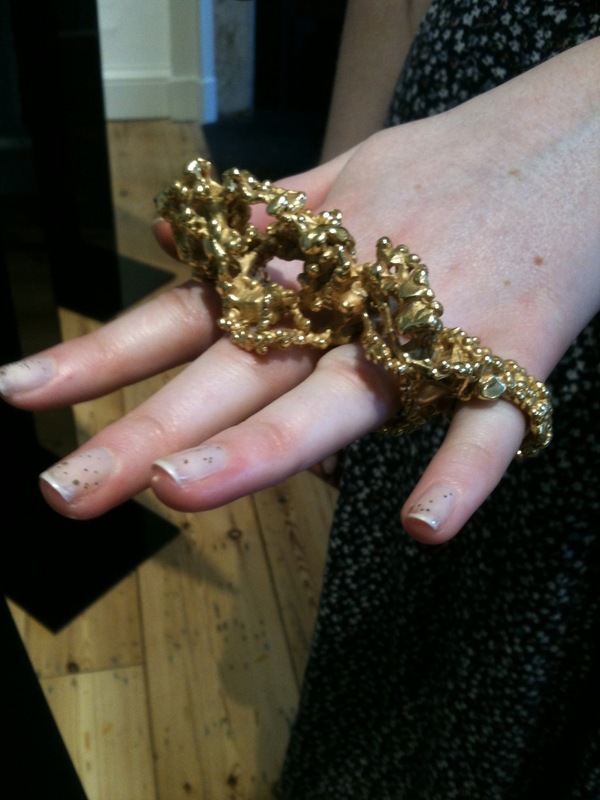 Sculptural jewellery designers Yunus & Eliza were showcasing some impressively enormous show pieces as was Imogen Belfield, whose Galactica Knuckleduster that I was still utterly enchanted by. Jo Hayes Ward had some impressive organic looking rings that were actually digitally created and printed out on a 3D printer in an incredible design feat that boggles the mind, and the iconic Alice Cicolini showcased her beautiful jewellery that takes its inspiration from sacred Indian architecture and patterns. 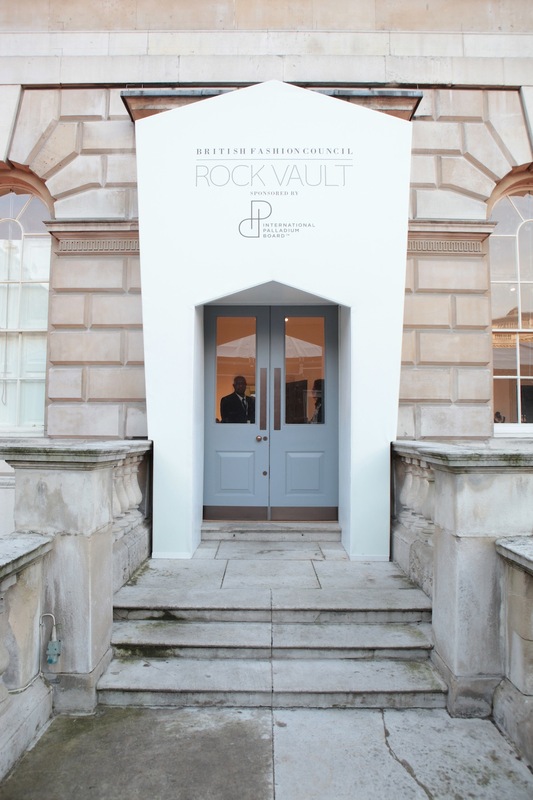 Rock Vault is fast becoming a British Fashion institution , and with it investing mentoring and sponsorship into its talented young designers, it will be exciting to see how their brands develop in the future.